Magnolia acuminata.Jeff McMillian @ USDA-NRCS PLANTS Database (Accessed 8/2014). 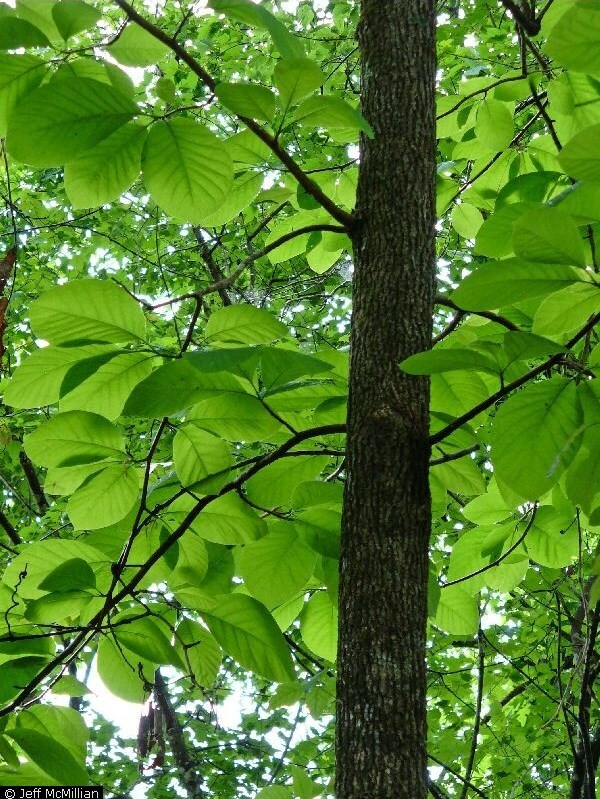 Magnolia acuminata is a tree, to 25 m tall, slender, trunk straight, bark furrowed, brown. Leaves alternate, deciduous, oblong-elliptic, to 25 cm long, tip abruptly pointed, base blunt or wedge-shaped, green, minutely hairy below, base of stalk and leaf scar “U” shaped. Flowers yellow-green, 6 petals, odor unpleasant, to 8 cm long, falling early; blooms May-June. Fruit cucumber-shaped, 7 cm long, turning dark red, becoming cone-like with individual scales opening to reveal seeds covered by bright red flesh (aril) held by a slender thread of tissue for dispersal by birds. Origin: Native to western NYS but not to NYC metro region. Habitat: Planted. Rarely escaping. Soil pH 5.2-7 (USDA, NRCS 2010).